This sections hosts a variety of materials ranging from documents to radio recordings and videos. 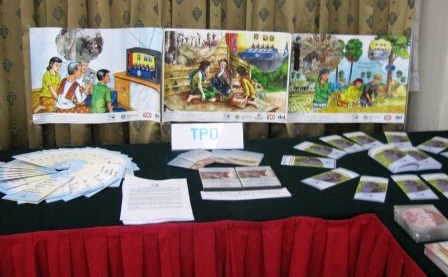 They are dealing with GBV during the Khmer Rouge regime or are products generated by CDP, TPO or VSS in the course of the project “Women and Transitional Justice in Cambodia”. Research and Documentation contains studies on the topic and other collection of stories. Reports on activities conducted throughout the project are collected under that section. Outreach and Advocacy includes materials produced to be used in this areas. Audio-Visual Material produced on the topic can be found under that section.